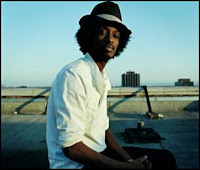 Ok so this song is incredibly cheesy, but I can't help liking K'naan's new track "Wavin' Flag (Celebration Remix)" and thinking that it is indeed perfect for the 2010 FIFA World Cup that is taking place in South Africa - it's got patriotism, happiness, strength all as themes, plus it has clear African influences. And let's face it: sports fans can get incredibly sentimental, so a sentimental song is fitting. Coca Cola has selected the song as their theme song for the 2010 World Cup at least - I don't know if that makes it the official theme song or what (I know Ricky Martin's "Cup of Life" was the official World Cup song in 1998). Anyway, listen and enjoy. telegraph21, a new curated video site just posted the behind the scenes recording of Wavin'the Flag. I think some Akon thing is the official song, but I thought they should have had K'naan do one instead, and hey presto!